Pour into a tall chilled glass full of crushed ice and garnish. We have the New Orleans based and Irish themed bar, Pat O’Brien’s, to thank for the popularity of the hurricane. Developed in the 1940s, this drink quickly became a tiki bar staple, but these days it is much easier to find its unnaturally bright red imposter, whose metallic pouches containing hurricane mix can be obtained from every corner store in NOLA. With a short, packet-free ingredient list, the original hurricane is refreshingly simple for a tiki drink: something like a big rum sour or a minimalist Fog Cutter. Despite being really simple, there aren't many things quite like this drink. It's boozy, with tart fruity depth and sour notes atop a heavy dose of ice. Passionfruit syrup adds a surprising amount of fruitiness and complexity, given that it’s the only ingredient besides rum and lemon. The icy, amber toned beverage is served in a tall, large capacity glass unique to this cocktail. The result is perfect for rainy spring days, when you’re stuck on a balcony waiting out the weather. The hurricane is a great opportunity to experiment with different rums. 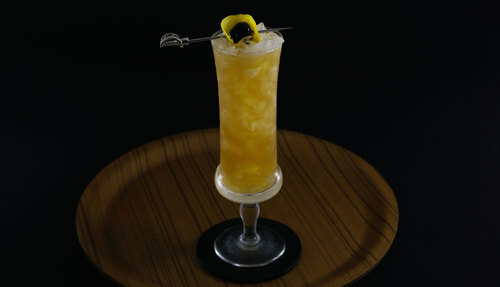 The recipe provided here, which is borrowed from Smuggler’s Cove: Exotic Cocktails, Rum, and the Cult of Tiki, calls for black blended rum. Any good Jamaican or Guyana black blended will work, but feel free to play around with what’s on your bar. We like Hamilton 86, Goslings is easily acquired, and Lemon Hart 80 would be delightful as well. If you desire a sweeter more traditional tiki drink, the dose of syrup could be increased. The nose provided by the combination of cherry and lemon peel complements the drink well, but feel free to get creative with garnish. As for passionfruit syrup, which may be a bit uncommon, we suggest trying BG Reynolds for a proper tiki mixing syrup. This drink needs heavy chilling, but we prefer to skip the complications of a blender. Our preferred approach is to combine the ingredients with a hefty dose of ice and shake like crazy, then pour into a frozen glass overflowing with crushed ice.